Detoxification is a process that our bodies undergo on a daily basis. We eliminate toxins via our liver, kidneys, lungs, and skin. In the midst of an increasingly toxic environment, however, our body’s ability to keep up with the demand is overwhelmed, because we encounter toxins so frequently! They are in our water, food, air, and living environments (paints, carpet and even furniture)! Even if you live in a tree house in a secluded rainforest, you are still exposed to toxins in your environment. Even if you eat 100% organic all the time and drink filtered water, you’re still at risk. Even baluga whales and polar bears, that live in a seemingly pristine environment, are found to have pesticides and other chemicals in their bodies. We are all affected! Eliminating toxins properly is crucial to vibrant health. Toxin overload is associated with a variety of diseases including chronic fatigue syndrome, inflammatory bowel disease, thyroid conditions, cancer, heart disease, and auto-immune disease. When toxins build up in your body, it leaves you feeling run down, tired, achy, and it leaves you more susceptible to disease. But it doesn’t have to be that way! Fortunately, our bodies are resilient and can bounce back with just a little effort in the right direction. The Shine Reset Detox is your “reset” button. Email info@shinenaturalmedicine.com or call 858 480 5024. It’s the perfect plan to clear disease-causing toxins from your body, get you back on track and feel great every day. Our 14-day detoxification program has been customized by our Shine doctors to fit your needs. This isn’t your typical “liver flush.” This program is a combination of a proprietary detoxification powder and proprietary supplements. This detox powder is a unique and advanced combination of nutrients, antioxidants, fiber, fruit and vegetable extracts (read: super foods! ), and pure herbs that support the overall metabolic detoxification process while balancing Phase I and Phase II detoxification pathways. Supplements also support both detox phases by ensuring proper protein digestion and eliminating gastrointestinal discomfort in addition to helping to protect the liver while chemicals and other toxins are mobilized for excretion. 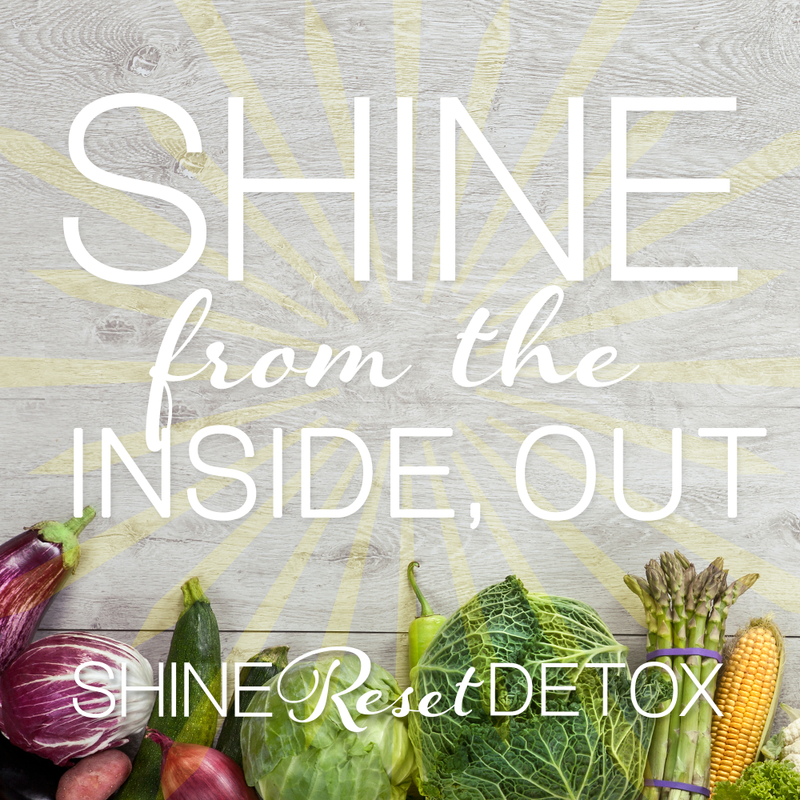 The Shine Reset Detox also includes an easy-to-follow meal protocol and comes with shopping lists, snack ideas, recipes, and more! Designed by our very own nutritionist Elizabeth! Detoxing without the support of a qualified health professional can be risky. What improvements do patients typically feel after the detox? Please come to our detox class to learn how to best include DETOX into your life.